I have a confession to make. I just started drinking coffee in the past year. I’ve always been a tea drinker, but never really understood the nuances of coffee enough to really enjoy it. There are dozens of different types of coffee drinks available to order around the world. This means that I often find myself standing at the front of the coffee line not knowing what to order. I’ve even given the deer-in-headlights look to a few waiters in countries like France and Italy when they ask me what type of after-dinner coffee I’d like. I don’t know what the appropriate thing is to order! Essentially, there are a multitude of different coffee drinks that you can order. They each can be made from different types of coffee, with varying levels of caffeine, strength, and additions, like milk or water. To avoid the embarrassment of not knowing what to order, I’ve sent the last year learning about the differences in each type of coffee drink. If you’re uncertain what coffee drink to order, or what each of the variations contains, you’ll find a detailed summary of coffee descriptions below that will help you tell the difference between the most popular coffee drinks. This list is for you if you don’t know the difference between a macchiato and a latte or when it is appropriate to order a cappuccino in Italy. We’ll start with the most popular drinks that you can find on almost any coffee shop menu around the world. This will give you a good base to order from, so you’ll always be prepared with an order when it’s your turn to order. These drinks can all be made at home with an espresso machine, if you’re thinking about getting one. There’s no drink easier to make than an espresso. The coffee grounds are packed tightly into the filter and hot water is forced through the filter to create a very strong dark coffee, typically served in 1-2 ounce portions. A double espresso is just twice the amount. Another fairly pure espresso drink is a macchiato, which is just an espresso shot, with a little bit of steamed milk on top. The milk tempers the strongness of the espresso slightly. Espresso served with half milk and half cream. A double shot of espresso added to water using a 1:1 ratio. A single shot of espresso served with steamed milk in a 1:1 ratio. Very popular around the world, the cappuccino is similar to a flat white, only the espresso is blended with extra milk before the milk foam is added. It is typically equally parts espresso, milk and milk foam. The cappuccino originated in Italy and remains one of the most popular coffee drinks you can order in Italy. However, Italians only drink cappuccino (or any milky coffee) in the morning, and never after a meal. A latte is similar to a cappuccino, but with more milk and only a thin layer of foam on the top. If you don’t like strong coffee, you’ll likely enjoy a latte. In most coffee shops, there are dozens of flavored syrups you can add to a latte to give it a bit of flavor. Vanilla lattes and pumpkin spice lattes are two of the most popular version you can get in the United States. Piccolo lattes or piccolo coffee is served in espresso cups unlike café lattes. Creamy and rich, piccolo lattes have a bitter taste. A mocha is essentially a cappuccino or coffee + milk drink with added chocolate, either in the form of cocoa or chocolate syrup. To me, they are the adult version of chocolate milk, and you don’t sound like a child ordering a mocha at a coffee bar. An Americano is an espresso that has extra water added to it. Americans typically drink a larger cup of lower-strength coffee, while Europeans drink small amounts of high-strength coffee. When you’re in Europe and want a coffee that resembles what you’re used to drinking at home, you can order an Americano. It’s not a typical filter-brewed coffee, but it’s close. This drink translates as coffee with milk. It’s a strong filtered or brewed coffee (not espresso), with warm milk added. This is the most popular way to order coffee in France and throughout Northern Europe. It’s not to be confused with a cafe latte, which uses espresso rather than brewed coffee.There are many different ways to order a simple cafe au lait, depending on which country you’re in. For instance, it’s called a cafe con leche in Spain and milchkaffee in Germany. In Switzerland, there is a popular variation called “café renversé”, which is made with milk as a base to which the coffee is added (the opposite of how it’s usually made). The flat white originated in Australia. It’s not a popular drink around the world. Flat whites are pure espresso (either a single double) blended with velvety milk foam. It’s similar to a cappuccino, only it is not blended with extra water or milk. Learn how to make the perfect flat white. A cortado originated in Spain. It’s a very similar drink to a flat white, but with a slight difference. It is pure espresso, but it is blended with steamed milk that is not textured or frothed in any way. This term is used to mean espresso. You may order it this way in Switzerland, Austria, and northern Italy, but it still means the same thing as espresso. Despite the word crema being added, it doesn’t have any milk or cream in it. The next set of coffee drinks can be ordered in various countries, and can also sometimes be found on specialty coffee menus, if you’re lucky. These drinks typically are considered specialty drinks, or contain additional ingredients other than coffee, milk and water. This espresso drink originated in Cuba. It is an espresso that is covered with a thick layer of sweet cream. The cream is made by mixing Cuban espresso with sugar until it foams. You then pour the espresso over the foam, which floats to the top and forms a sort of cap on the coffee. This drink is often found on the bar menu, rather than the coffee shop menu. It’s considered a cocktail, though it’s still a coffee drink to me. Irish coffee consisting of hot coffee, Irish whiskey, and sugar, stirred together and topped with thick cream. You then drink the coffee through the cream. It’s sweet, rich and warming, all at the same time. This drink is made differently than most coffees. You prepare it by boiling water with really fine, medium roast coffee grounds in a wide-bottom copper pot, without a filter. As the coffee warms over the stove, a thick foam starts to form, which will be transferred to cup. You can then add the desired amount of sugar to each cup of coffee before it’s served. Turkish coffee is thicker and roastier than espresso. Greek coffee is very similar to Turkish coffee, only the coffee grounds used are not not usually as roasted. The resulting color of the coffee is lighter and has a less pronounced roasted flavor. It is is boiled in a tall, narrow pot known as a briki, and served with the grounds in the bottom of the cup and the layer of thick foam on the top. Frappé coffee can be found in Greece. It’s one of the most popular cold coffee drinks and locals order it often. It’s a foam-covered iced coffee drink made from instant coffee, water and sugar, served over ice in a tall glass. This drink is dessert in a glass. It consists of either hot or cold espresso (a single or double shot) topped with a scoop of vanilla ice cream, and maybe even whipped cream and sprinkles or chocolate sauce on top. 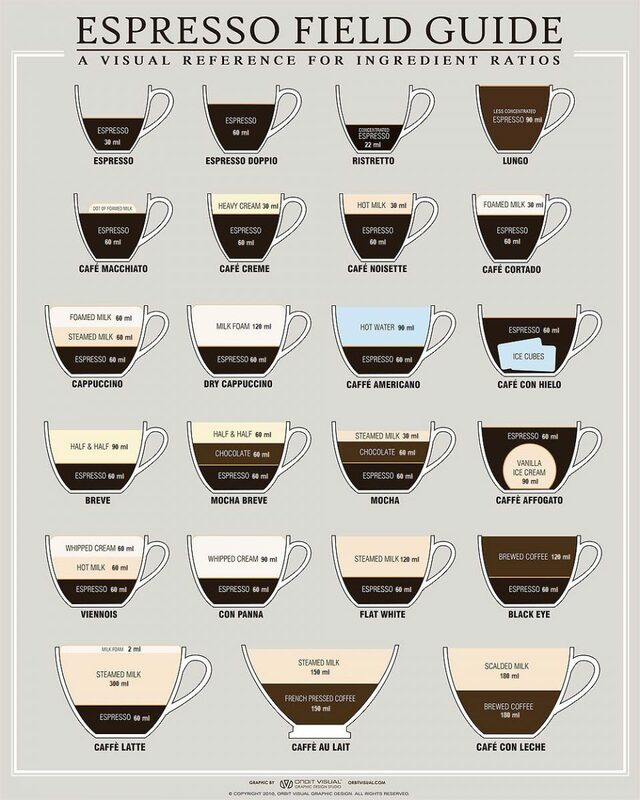 If you’re a visual learner, you can find most of the drinks and their proper ratios on this awesome coffee infographic (Credit: Espresso Field Guide by the aptly named Jay Mug). If you made it through that long list of the different types of coffee drinks, you can now consider yourself schooled on the proper terms for the coffee you want to order. You won’t have to stare blankly at the barista next time she asks for your order. Of course, you may also want to do some practical research of your own, in which case you should pull up this list next time you’re at the coffee shop, and try something different.